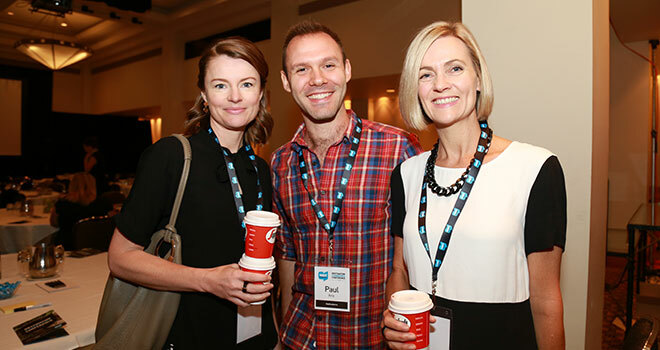 Hosted by David Barker and Nicole Turnbull from Visit Canberra, the event presented 14 keynote speakers and a series of plenary sessions to almost 250 people. The aim of the conference was to help educate business on how to best leverage the CBR brand, and to take advantage of the growing reputation that the region has built. The very first speaker set the tone for the event. John O’Sullivan, Managing Director of Tourism Australia, gave an excited overview of the current market and identified many of Canberra’s strengths. Armed with an impressive amount of data to back up his claims, John’s presentation would provide context for the speakers to come. If you had any doubts of the economic value of tourism to the Canberra economy, it would have been dashed 15 minutes into the hour-long tour-de-force of stats and exciting aspirations out to 2020. A great innovation was the introduction of the DCC mobile app. Powered by Eventmobi, this was fantastic for allowing attendees to quickly discover more about the presenters or check the program. One of the main benefits was the ‘chat’ function’ which allowed for seamless networking and quick contact acquisitions. There was, however, one overarching message. In the room was a collection of people dedicated to promoting Canberra. Be they a single-operator business or a huge national institution, it was clear that everyone there was facing in the same direction. With that sort of energy and support, there is little doubt that the world’s coolest little capital will continue to grow from strength-to-strength!